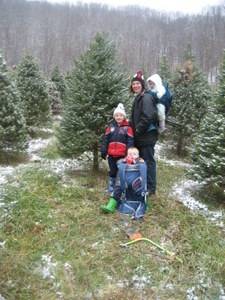 A family has found their tree! A young customer eyes the fields from the hay wagon. Trees alone are not what lure families to Hutton-Loyd year after year. It is the bonding experience of picking out that perfect specimen and cutting it oneself that draws our customers – a tradition made even more engaging by the gorgeous valley setting of the farm and the many other activities it offers. Better yet, enjoying the farm with your loved ones is free! Buying a tree is not mandatory. We gladly welcome any families or individuals that simply wish to enjoy the feeling of meandering about our fields and forests in the company of holiday cheer. 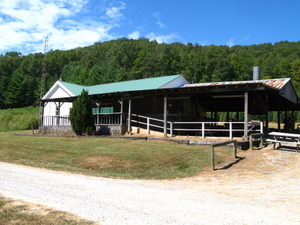 A day on Hutton-Loyd begins when you and your loved ones turn onto our gravel farm road, cross the dam that quietly restrains our placid forty-acre lake, pass into the valley, and arrive at the cluster of buildings referred to as our “Christmas Center.” You may tarry here if you please. Many folks do and there are many reasons why (we’ll get to them later). Indeed, we invite you to do so. Eventually, however, it will be time to go hunting for your tree. After pointing you to the fields with the trees suiting your wishes, we will hand you a bow saw and bid you happy hunting. On weekends, the most stylish way to get from buildings to the fields is a ride on our hay-wagon pulled by our merry green and yellow John Deere, but that is not the only way. If it is a weekday (when hayrides don’t run), or if you simply prefer, you are welcome to walk to the fields or drive your own vehicle. Once among the trees, you have the rest of the day to be as picky as you please. Whether you seek a perfect pyramid of exact dimensions, or you want a “Charlie Brown” tree complete with a gap from where it once hid a young fawn and nest from where it once sheltered a brood of sparrow chicks, we believe that somewhere in our fields you will find it. 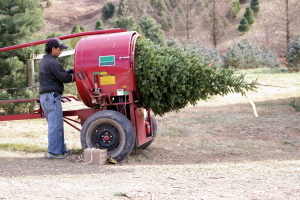 A Fraser Fir is prepped for bailing. Having located your prize specimen, you will cut it and bring it back to the Christmas Center. (We will gladly provide assistance in cutting and carrying to anyone who requests it.) There we will measure the tree, mechanically shake the dickens out of it to remove the dead needles it conceals, bail it (wrap the branches up with twine to make the tree more manageable), and secure it to your vehicle. Some customers prefer a dug Christmas tree that they can plant in their yard after the festivities are over as a monument to family togetherness or donate to a good cause. No problem, if you are such a customer you will simply mark your tree with our ribbon (be sure to ask for it before heading to the fields) and we will dig it promptly after you return and inform us of its whereabouts. In the meantime, you will be free to browse about the center. You might wish to spend your time selecting among wreaths, garland, tree stands, and the many decorations made from our greenery. By far the more popular attraction after spending time out in the winter air, however, is our open pit fire. Huddled around the roaring blaze, you may warm yourself inside and out with hot cocoa and coffee, recounting stories of Christmas adventures present and past and roasting marshmallows for the s’mores we offer. Once again, you may linger as long as you like – the longer you stay the more honored we will feel. But engagements press and days end, so eventually you will find yourself crossing the dam in the other direction, tree lashed to car, off to see how your coniferous luggage will look in the living room and, we truly hope, to return next year and continue the tradition once more.